I sure am! And if the wines were as delicious and exotic as they were last week, you should be going too! Last week Joe Saglimbeni welcomed the lovely Felicia Gonzales of Serendipity Wine Imports here in San Antonio. She was featuring wines from Argentina and Uruguay! I don't know about you, but I don't get to taste wines from Uruguay very often, so this was a real treat! 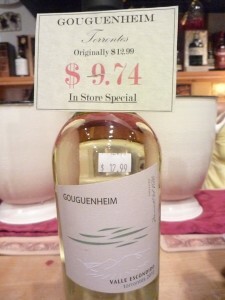 The 2010 Gouguenheim Torrontes from the Valle Escondido in Mendoza, Argentina. This was definitely a “sip on the patio on a hot summer day” wine. Lots of beautiful floral and light citrus aromas, you can also throw in a hint of grass and gorgeous acidity. Craving lemonade, try this wine instead! :) And last week, we took this bad boy home for $9.74! I was even more impressed with the 2010 Bouza Albarino from Montevideo, Uruguay. FYI, the Albarino grape used to make this wine is most famously grown in it Galician home of Rias Baixas in Spain, but is grown exclusively by Bouza Bodega in Uruguay! This wine danced with aromas of lemon zest and almonds, it had hints of herbs and white flowers, and even a bit of a green apple scent to it. 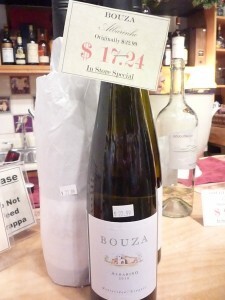 This was a great wine and certainly worth the price of $17.24. 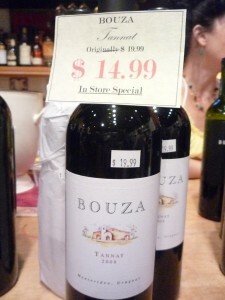 The last wine that made the cut was another wine from Bouza Bodega in Montevideo, Uruguay, the 2008 Tannat. The Tannat grape originates from France, but really has found a home and great expression in the terroirs of Uruguay. This is definitely a steak kind of wine with its manly tannins and deep red color, aromas of dark fruits like ripe plums and blackberries, and hints of vanilla and a kiss of barnyard. A great value at $14.99. So I look forward to seeing you tonight from 5-8:30pm at Joe Saglimbeni’s Fine Wine & Spirits Shop … so get off the computer and back to work so you can finish in time to head out to the tasting!